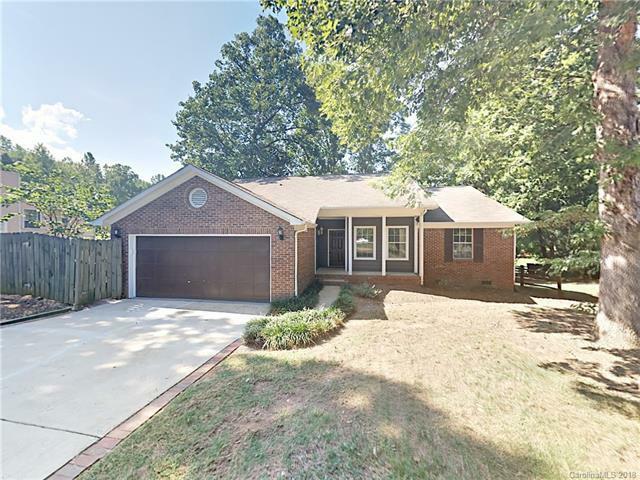 Beautiful 3 bedroom home in Charlotte neighborhood near schools and shopping. Brick veneer exterior and covered front porch. Open living room/ dining area off entry with cozy fireplace and large windows. Eat in kitchen showcases new stainless steel appliances, laundry closet, tile counter tops, and window seat. Generous newly carpeted master bedroom includes en-suite bathroom with dual sinks, glass shower, and separate tub plus walk in closet. Wood deck off rear of home overlooks large backyard with wooded view. Perfect spot to relax at the end of the day!! A must see!!! The data relating to real estate on this Web site derive in part from the Carolina Multiple Listing Services, Inc. IDX program. Brokers make an effort to deliver accurate information, but buyers should independently verify any information on which they will rely in a transaction. All properties are subject to prior sale, change or withdrawal. Neither Carlyle Properties nor any listing broker shall be responsible for any typographical errors, misinformation, or misprints, and they shall be held totally harmless from any damages arising from reliance upon this data. This data is provided exclusively for consumers' personal, non-commercial use and may not be used for any purpose other than to identify prospective properties they may be interested in purchasing. © 2019 Carolina Multiple Listing Services, Inc. Data last updated 2019-04-23T14:59:06.38.